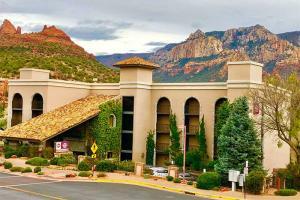 Surrounded by the brilliant red rock buttes, sprawling green pine forests, and staggering canyon walls, the Best Western Plus Arroyo Roble Hotel Creekside Villas offers a tranquil getaway. Guest rooms offer plush bedding, 46-inch LED TVs, free Wi-Fi, refrigerators and microwaves. Start your day right with a delicious hot breakfast each morning, compliments of the hotel. The Arroyo Roble Clubhouse features indoor pool and outdoor pools, a steam room, sauna, a game room and a fully equipped fitness facility.